Why is the European Union criminalizing and threatening refugees and volunteer helpers? Over the past few years, Denmark has changed its asylum laws, and now with their new Alien Act more helpers are being persecuted. While in 2014 about 140 were prosecuted for helping refugees, the number grew to 279 between September 2015 and February 2016. Zornig’s lawyer, who has defended other Danes in similar cases, declared Denmark is now at the bottom of the table on human rights. However, the anti migrant trend has affected every member state of the European Union. In January, five rescuers from Spanish and Danish NGOs who rushed to help refugees stuck off the coast of Lesbos on a frail craft were arrested and also accused of smuggling migrants. This criminalization of helpers mirrors the criminalization of refugees. In the age of austerity policies, the European neoliberal leadership is all about fences, walls and barbed wires. They follow the US model closely. On the island of Lesbos in Greece, the police formed a human chain to block volunteers whose goal was to bring emergency support. When the doctor of the group wanted to assist a baby who seemed to be unconscious, the police shouted that these people were prisoners! 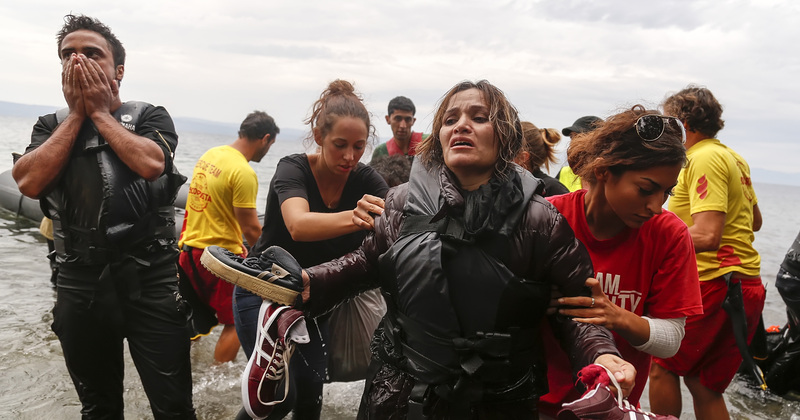 The European Commission along with member states continue to bargain with human lives. They barter with the Turkish President Recep Tayyip Erdoğan, himself involved in ethnic wars and repressive actions against journalists, activists, and scholars in his own country. Despite the opposition of European deputies and activists, the European Commission signed an agreement with Turkey to relocate refugees stuck in Greece in Turkish camps with no guarantee for safety, rather with more inhumane conditions awaiting them. In so doing, the Commission demonstrates that in this modern time the violence of the exercise of power depends less on its physical brutality than its ability to treat burdensome populations with indifference for their wellbeing. In its latest report on the refugee crisis the Commission set the priorities for 2016. The Commission pleas for an “asylum system based on solidarity and fair sharing responsibilities,” but this self-serving language cannot conceal the constant breach of human rights occurring at the borders of Europe. In fact, the European Union has increased the power of FRONTEX, a heavily repressive mechanism that replaced Mare Nuestro. NGOs and volunteers have become wary of FRONTEX, which has forcibly controlled helpers and threatened them with fines. Volunteers explain that Frontex has called into question the status quo that allowed every one to help in good intelligence, as if the authorities’ goal was to bring down the humanitarian response. Member states and the European Commission have already brought down the humanitarian response to the organized murder of populations. Dehumanization and deterritorialization are effectively the core values of the elites of our time. Petitions are circulating to denounce the inhuman face of Europe, which we should understand as the inhuman politics of austerity as well. These inhuman measures and agreements are only possible with a racist eye that separates those who may live from those who must die for the advance of a dramatic political economic system.